Q. How do I convert a bibliography in Word into an EndNote file? Select the EndNote ribbon with Word. From the Tools group, select Export to EndNote and choose Export Travelling Library. 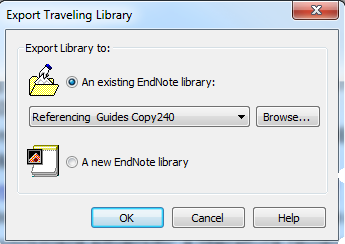 In the Export Traveling Library pop up window, either choose to export into an existing EndNote Library or create a new EndNote Library.